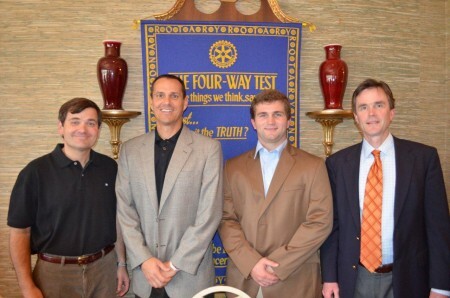 Auburn University Baseball Coach John Pawlowski (second from left), now in his fourth coaching season at Auburn, previewed the team's 2012 schedule for the Auburn Rotary Club. Joining Pawlowski was 2011 team captain Wes Gilmer (third from left), who is now serving as an undergraduate assistant coach for the season. The coaches are pictured with program host Brian Keeter (far right) and club president David Reeves (far left).